Reading baseball books can sometimes be a double-edged sword. On the one hand, you get the inside story of what really happened. On the other, you see that our baseball heroes are human too. For me growing up in Philly, Glenn Wilson was one of those heroes. I spent many summer days at the Vet watching Glenbo roaming the outfield. He also ties into one special childhood memory I have. It was early in the 1985 season and it was Tastykake team player card giveaway day. I remember sitting in the outfield stands watching Glenn play with grace. It took some convincing to get my Dad to go to the game, and my Grandfather came along as well. It was the only time the three of us ever went to a game together, and for no particular reason Glenn Wilson always stuck out in my mind from that day. For that reason alone, I was pretty exited to jump into this book. When you are a kid you think your favorite players have to be good guys. How else could they be? I mean really you think they are awesome so why wouldn’t they be. But sometimes reality does not quite live up to expectations and that happens here. Glenn Wilson flat-out admits during his baseball career that he was somewhat of a jerk. He admits he might not have appreciated the talent he was given and felt he was owed something. That right off the bat has to be hard for anyone to admit, I know I couldn’t do it. So now that my childhood reality was shattered I jumped further into this book and found it to be very interesting. Glenbo reviews his years of growing up and making it to the majors. He talks about some of his family and how they helped him along the way. He also talks about his time with the Tigers and his disappointment in being traded to the Phillies. Struggles in Philadelphia are talked about along with some other issues in other cities along his journey. He takes the time to be honest with the reader and not try to sugar coat any of his behavior. If he was a jerk about something he freely admitted it. His struggles after leaving baseball was something I never heard about before, and to Glenn’s credit he is very honest with himself and the reader. As a reader I appreciate it when the player is honest with me. It adds loads of credibility to his story instead of just writing a book for a money grab. The bottom line of this story is that after baseball and some personal issues Glenn was a broken man. What happens next is something that I found most interesting. Glenn turns to his faith and trusted in God and that faith helped him transform his life. I will not go in to great details here of the way God has helped Glenn transform his life and become a better person. You will have to read the book to get that story, but quite honestly it is a very remarkable story. I sometimes shy away from books that have a religious aspect to them, because they don’t always come off as genuine and that to me is the ultimate disrespect. That being said, this story is absolutely amazing and the effect it has had on Glenn Wilson’s life has been remarkable. 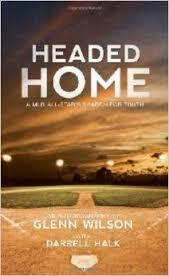 If you are a fan of Glenn Wilson’s this is a really good book and worth reading. He is brutally honest about his life and himself, on and off the field. This book is also a good read if you are having troubles in your own life, because it shows the strength you are able to find by turning to God. Now if only someday I can get my Tastykake photo signed to complete my childhood dream!